Where ocean currents of the breakwater bay San Andres come from. The photo of ocean currents by the Santa Cruz San Andres breakwater was taken in Spring at the beginning of March 2012 from high up on the mountains of the Anaga Massif. The exact spot is in the north east of the biggest of Canary Islands, about 10km from San Andrés. Notice the scintillating white stripes. Almost all go gently in one direction, as is typical for water currents in Tenerife Winter and in Spring. This is how the ocean surface is being pushed westwards towards Beach Playa de las Teresitas. 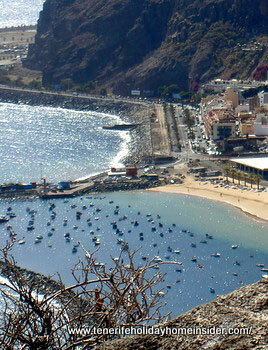 This bay with fishing port is located in the north of the island's capital. The image with its water movement happens thanks to the Elysian winds. By the way, the latter were already known by the Elysian fields of Greek Mythology. So what do we gather from the photo? Obviously, the waves are much calmer for safe swimming where you see deep blue patches very near the San Andrés hamlet. This is the case near and by the fishing boats but also behind the diagonal breakwater, which is a man made boat jetty. Certainly, the situation of wind and currents of the sea change a little during the course of the year. Trade winds of Elysia act on two levels. One of them directs Canary currents. I like to differentiate between Elysian winds A and Elysian winds B. The A winds comb the ocean surface and bring up colder water. This 'upswelled' part of the deep sea is then taken along to shore. Consequently, those so called north east trade winds contribute much to a more temperate climate for the Canary Islands because of that phenomena. 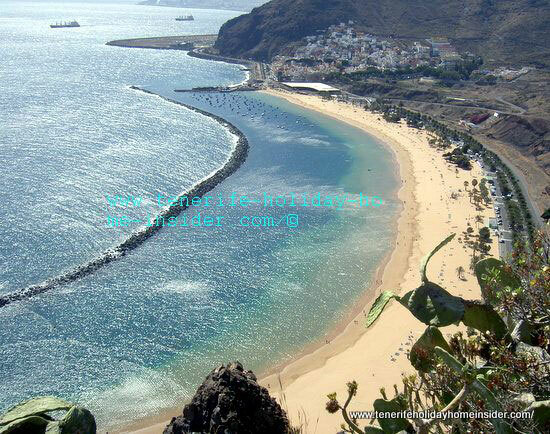 Perhaps, the more south eastern location of beach Playa del Inglés of Las Palmas de Gran Canaria is not less effected by the cooler currents, but may be hotter due to its nearness to Africa and to the Equator. Near it, the Canary currents turn west again due to our reversed earth magnetism. The B winds work in altitudes of up to 1500m. Both types of Elysian winds contribute to the moderate climate of Tenerife and to that of the rest of the archipelago, very much. Those notorious Canary winds don't generally reach gale force but may show more power in mid summer. Then, more than 150 meters may be upswelled from the depth of the Atlantic. The ocean movement which is depicted above has mid-afternoon water flow. Obviously then, fishermen preferred not to take their boats out onto the open sea. However, there may be other factors than the run of the ocean surface water to blame for. Also may be. fishing is done early in the morning. By the way, Elysian winds originate from as far as the 28th and 29th degree ocean parallel near the Tropical cancer, while the upswelling is thought to take place on the Continental shelf. Much more research is needed. Winds and currents don't behave the same all the time during the course of the year. This is why there are also best seasons for sailing and best times of the year for championships by certain surf beaches. Winds and ocean currents may even change somewhat due to global warming, while not enough is known about it. One fact has come to the attention of the area of Las Teresitas. This is all about fierce August waves by San Andres of Tenerife who seem to get bigger by the year, while drastic precautions will be taken. From ocean currents back to breakwater which was an important environmental issue for San Andrés Tenerife.